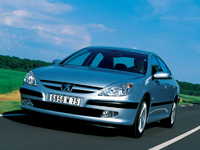 Since its launch, the Peugeot 607 has offered owners one of the most comprehensive standard specifications available on an executive vehicle. Now the comprehensive standard specification is strengthened further with the introduction of Peugeot’s new Euro 4 170 bhp 2.2 litre twin turbo-charged HDi diesel engine. Producing 170 bhp at only 4000 rpm, the jewel, however, in the engine’s crown is the maximum torque of 277 lb ft produced at only 1,500 rpm. The use of sequential twin parallel turbochargers is a world first on a 4-cylinder diesel car. The system (patented with Honeywell Turbo Technology) consists of two identical, small-diameter turbochargers. At low engine speeds, a single turbocharger ensures engine responsiveness. It is then supported by a second turbocharger, which starts to operate in parallel between 2600 and 3200 rpm according to the applied load and atmospheric conditions. The entire range of engine speeds is therefore covered. The system is controlled entirely by the engine’s electronic control unit (ECU). In addition, the low inertia and small size of the turbochargers reduce response time and improve throttle response. These technological innovations enhance driveability and, in particular, ensure excellent torque availability. This enables the driver to drive at lower engine speeds, thereby reducing fuel consumption. With the introduction of the new 170 bhp HDi engine, the 607 range now includes three engine options – 2.0 litre 136 bhp HDi, 2.2 litre 170 bhp HDi and a 3.0 litre V6 petrol engine. These engines are all available in a single trim level – Executive. Five exciting exterior body colours – Aluminium, Astor Grey, Montebello Blue, Lunar Mist and Onyx Black – are the only available options on the 607. Value for money has always been a strength of the 607 with one of the richest standard specifications available in an executive car. Other executive car customers are faced with the prospect of adding extra costs to their purchase, due to a poor standard specification.